Conspiracy buffs of the world, rejoice! High-stakes political assassinations and the inscrutable tales of intrigue that inevitably accompany them are back in the headlines! In the last few months we've had new evidence surfacing about old cases like RFK and JFK that have been unresolved for decades. We also have many exciting new cases emerging from places like London, Beirut, Moscow, and Gaza -- cases that promise to be unresolved for decades to come. It cetainly won't be possible to resolve all these cases here, though a few winks and nods toward our favorite theories will be hard to resist. However, there are some very important implications to be drawn from examining these political assassination cases side-by-side -- especially for the bloodless abstractions put forth by the tiny, vocal group of unabashed neoimperialists at the Council on Foreign Relations, the Harvard Law School, the National Review, and the American Enterprise Institute who have been trying to rehabilitate assassination as an acceptable tool of US foreign policy. 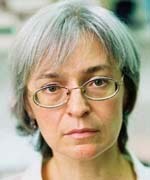 In recent weeks we've been treated to a flurry of assassination news, including the dramatic polonium -210 poisoning of former KGB agent and Putin critic Alexander Litvinenko in London; the gangland-style slayings of investigative journalist Anna Politkovskaya and Andrei Kozlov, Deputy Governor of the Russian Central Bank, in Moscow; the fatal ambush of the Lebanese Christian Falangist leader Pierre Gemayel in Beirut; and UN approval for an international tribunal to pursue another Lebanese case, the February 2005 slaying of Prime Minister Rafik Hariri. While players like the Russian mafia and other "private enemies" cannot be completely ruled out in these cases, it is suspected that most of them were "political assassinations," in the sense that the perpetrators were sponsored by hostile states or key factions within them, which were motivated by the desire to eliminate politically-influentlal enemies -- often across international borders. In principle such political assassinations are to be distinguished from purely-terrorist attacks, as well as from attempts to eliminate "military" leaders -- for example, the June 2006 US Predator attack on Abu Musab Al-Zarqawi, the July 2006 explosion that killed the Chechnyan rebel Shamil Basayev, and Israel's innumerable targeted assassinations in the West Bank and Gaza. In practice these distinctions often break down, given the fact that assassinations also terrorize, and that leaders like Basayev, Sheik Yassin, and Al-Zarqawi have also played important political roles in insurgent organizations. But part of the price of being an insurgent from a state-less organization, rather than a conventional politician, journalist, agent of the state, or crusading bishop (Romero) is that one's enemies find it much more legally and socially acceptable, as well as more useful, to kill quite openly, and to take credit for the achievement. This kind of official credit-taking rarely occurs for the type of cases cited earlier. Even if the targets happen to be corrupt politicians or blood-stained former KGB agents, they are deemed to be more "respectable" than the typical insurgent; indeed, conspiring to eliminate them is usually against the law. So responsibility must be hidden -- in many cases, for decades. This brings us to the other recent events that have brought this subject back to the surface. These include the 43rd anniversary of the (by now faintly-observed) assassination of JFK on November 22, 1963 in Dallas, and the recent release of "Bobby," a feature film about events at the Ambassador Hotel in Los Angeles on RFK's last day, June 5, 1968. They also include a striking news report that aired on BBC 2 on November 20, highlighting the new findings of filmmaker Shane O'Sullivan about the RFK assassination. 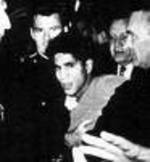 According to O'Sullivan, a careful reexamination of photos taken of the crowd that fateful night at the Ambassador has disclosed the presence, in proximity, of at least three long-time CIA covert operatives who had already become notorious among JFK "assassination buffs" (we wear that label proudly) for other reasons. The men in question were not random associates -- they had all held senior positions in 1962-64 at JM/WAVE, the huge Miami CIA station that was heavily involved in anti-Castro plots and the recruitment of allies among Cuban exiles, US veterans, and the Mafia. 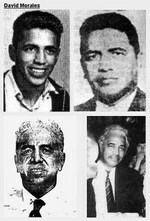 According to O'Sullivan, these were Gordon Campbell, the former Deputy Director of JM/WAVE; George Joannides, the former Director of Psychology Warfare at JM/WAVE; and most interesting of all, David Sanchez Morales, a senior assassinations and sabotage expert who also worked for the CIA in Venezuela, Uruguay, Laos, and Vietnam, and also reportedly developed a close relationship with Chicago mob boss John Rosseli. Roselli's body ended up in an oil drum off the coast of Miami, a week before he was supposed to testify before the House Select Committee on Assassination that was reinvestigating the JFK case.